Original Release Notes: How do you bring a child's curiosity to life? For Tobin Sprout, formerly of indie rock icons Guided by Voices, the answer is to revisit it with the wounded tenor of an aging piano man; someone searching, desperately, for his place in the cosmos. 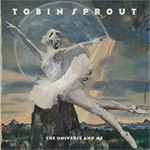 The Universe and Me is Sprout's sixth solo album; hatched during a seven-year gestation period that included unearthing lost recordings (the single, "Future Boy Today/Man of Tomorrow" for one, was being saved for GBV), and digging through a treasure chest of memories in his home studio in Michigan, where Sprout composed behind his shambling grand piano and trembling, boyish voice. Each home recording was captured live with Sprout's new band - which led to marvelous imperfections. The Universe and Me takes �a deliberately primitive approach that focuses on feeling, as opposed to production. The result is a vague bridge �between the ballads of psych-era Beatles, �and the haunting vulnerability of Daniel Johnston's Hi, How Are You?. It's no surprise, then, that Sprout penned and illustrated his own magical children's books as The Universe and Me �plays like a deceptively dense reimagining of simple subjects like comic books, finding your purpose in life, and growing old. Many of the 14 tracks acts like a diorama of a boy's imagination, like "Future Boy/Man of Tomorrow," which was inspired by Sprout's fascination with superheroes from his youth. The wistful "When I Was A Boy" is a short, stunning ballad relating childhood grounding to adulthood. "Walk Across the Human Bridge" is a heavy-hitting rocker driven by shredding and lyrics describing the decline of humanity. "Tomorrow From Heaven" is about dealing with the sadness that follows death. Pasted together as a collage, as opposed to a rigid whole, and we have �the soundtrack to Tobin Sprout's life. The Universe and Me will be available on Burger Records on January 20, with a limited pressing of a baby blue vinyl for the first 300 copies. Following the release, Sprout and his new band will embark on a nationwide tour. This will be his first tour in over a decade, supported by Burger Records, who'll be reissuing Sprout's mid-'90s Matador albums � Carnival Boy and Moonflower Plastic - in the months ahead.